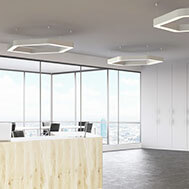 Steon Lighting are excited to announce the latest addition to our website, the Forma LED collection. The Forma collection is made up of a range of geometrical shaped luminaires which are available in a diverse range of sizes and outputs; these luminaires can be either surface or suspended mounted. These modernistic architectural products are capable of delivering striking aesthetics coupled with impressive photometric performance, making them ideal for lighting schemes in areas such as hotels, receptions, corridors and retail environments. This range of luminaires are accommodated within our technical brand, Steon, as they are manufactured using state-of-the-art-technology to achieve high output and performance. The products boast quality and reliability combined with a long service lifetime, other characteristic features include excellent luminous efficacy. All of the Forma luminaires are available with DALI dimming and a choice of 3000K and 4000K colour temperatures to suit individual preferences and requirements. For more information on the Forma luminaires please visit the product pages here. Steon Lighting design and manufacture LED lighting solutions for commercial, industrial, healthcare, educational and residential applications. Our three registered brands, Steon, Luxace and Historix, are the result of numerous stages of research and development in order to achieve an all-inclusive product portfolio to satisfy the varied requirements of our diverse clientele. We are committed to improving our product ranges by providing more innovative and energy efficient solutions. 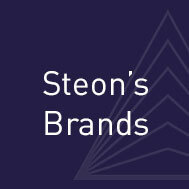 Steon is our technical and longest established brand from which the company takes its namesake; it features prominently within our product portfolio. This exclusive brand offers durable, flexible and high-quality products which are suitable for application across the board: from anti-ligature luminaires for secure environments to emergency lighting and compliant lux level solutions for educational institutions. Only the highest quality components are used in the construction of these luminaires. Rigorous and thorough testing and control procedures are undertaken to ensure all products leaving our factory are designed and manufactured to the highest standard and merit the extended warranties we provide as standard. Luxace is our contemporary brand where the luminaires can be used to create striking impressions and innovative lighting designs with statement products. Our decorative range of luminaires lend themselves to contract feature lighting primarily in interior environments, for example: bars, hotels and modern commercial environments. Luminaires within our Historix brand benefit from timeless classic and period aesthetics whilst utilising the latest lighting technologies. These state-of-the-art products are ideal for more traditional heritage environments; examples include listed buildings, educational facilities and places of worship. We have Historix luminaires suitable for exterior applications, incorporating these luminaires into landscape designs not only compliments the architecture but also provide safer environment after dark. If you have any on-going projects which you would like us to take a look at, please do not hesitate to contact us.